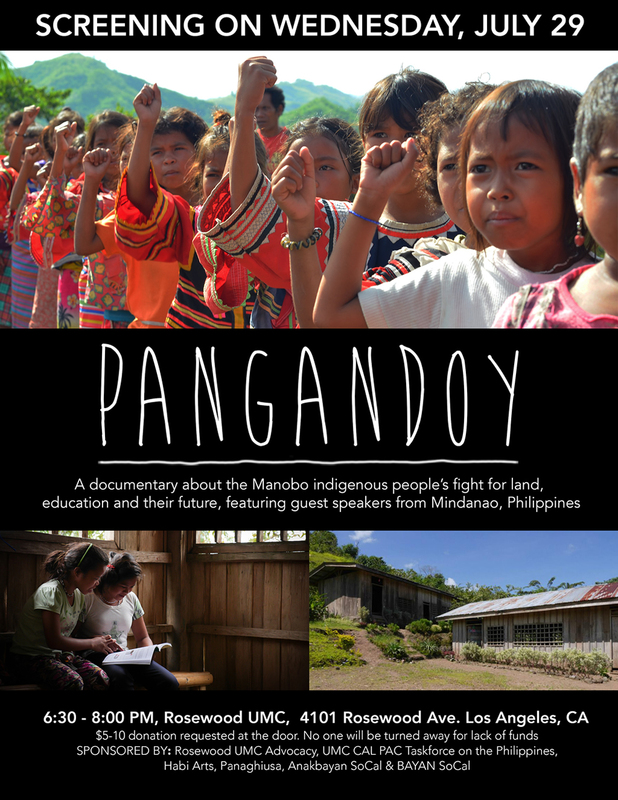 “Pangandoy: The Manobo Fight for Land, Education, and Their Future” is an inspiring short film by Hiyas Saturay during her trip to Mindanao Philippines working with the indigenous people of Mindanao and their struggle to access their schools and ancestral land. The film is a product of her three-month stay with the Talaingod Manobos (indigenous people from Mindanao) to learn about their history, culture, and struggle for education. 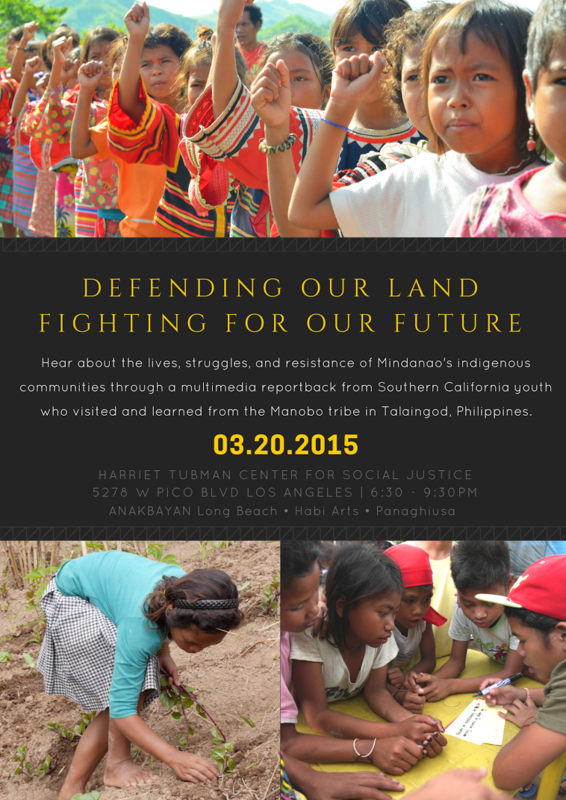 We will be hosting local screenings in the LA area and on various college campuses. Vennel is a youth activist serving as the Deputy Secretary General of BALSA Lanao, a citizen-led response to Typhoon Sendong and Typhoon Pablo and advocacy for climate justice. He is involved in environmental campaigns and indigenous peoples’ rights as the Secretary General of Panalipdan Youth-Northern Mindanao. Amirah is a Muslim woman leader based in Mindanao and National President of Suara Bangsamoro (Voice of the Moro People). She attended the International People’s Tribunal in Washington D.C. this summer and will discuss the Mamasapano incident, Bangsamoro Basic Law, and the overall human rights situation for indigenous Moro people in the Philippines. Sister Famita Somogod is a Catholic nun and coordinator of the Rural Missionaries of the Philippines-Northern Mindanao Region (RMP-NMR). 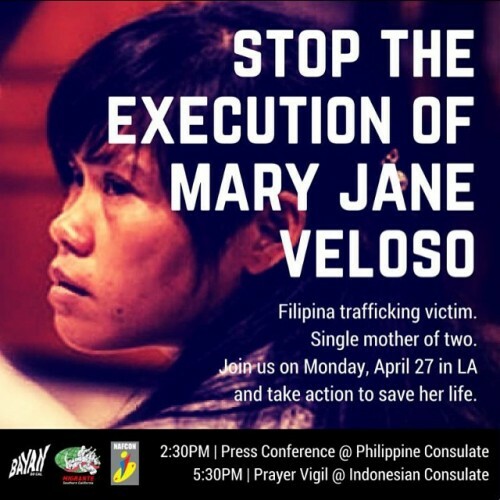 She a co-convenor of the Save Our Schools (SOS) Campaign, to advocate for indigenous community-based schools that provide free education to underserved areas in Southern Mindanao, Philippines. Hiyasmin Saturay is 24-year-old artist and filmmaker born and raised in the Philippines. Her family was forced to move to the Netherlands as refugees when the Philippine military targeted her family for organizing against a mining company trying to gain access to their island of Mindoro. She has a Bachelor of Arts degree in Human Ecology from the College of the Atlantic in Bar Harbor, Maine. 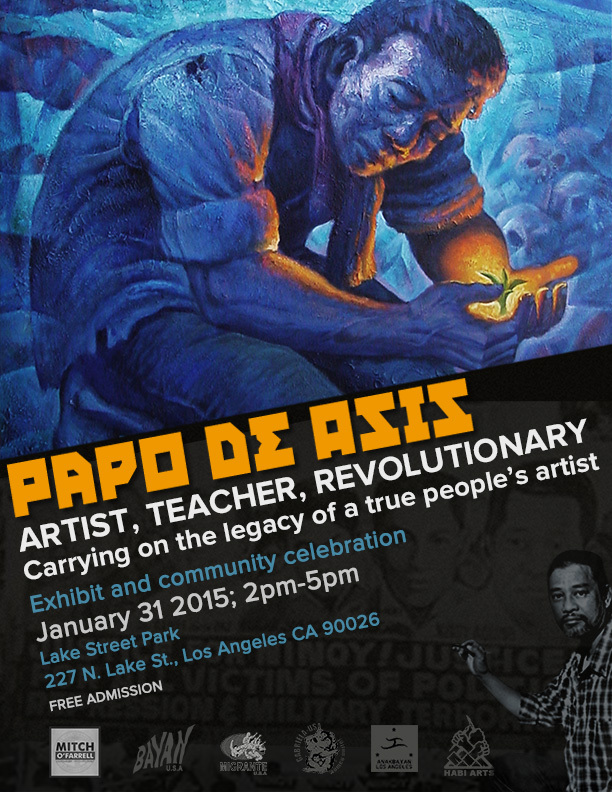 She resides in Long Beach, California and is a member of Habi Arts, an LA-based organization of Filipino artists fighting for national democracy in the Philippines. Her recent film, “Pangandoy: The Manobo Fight for Land, Education and Their Future,” was a product of her three-month stay with the Talaingod Manobos to learn about their struggle and resistance. Our report back is coming up on the 42th anniversary of the declaration of Martial Law in the Philippines and we have much to share about the people’s determination to overcome both man-made and natural disasters. Please come and spread the word! 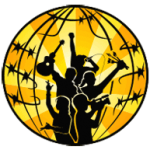 On August 2-9, 2014, over 30 people from the USA joined the National America-Philippines Solidarity Affair (NAPSA) and Rehabilitation Mission in Southern Mindanao, Philippines. The NAPSA 2014 was initiated by Panaghiusa (“Unity”) and joined on by the youth of the Kapit Bisig Kabataan Network (KBKN). 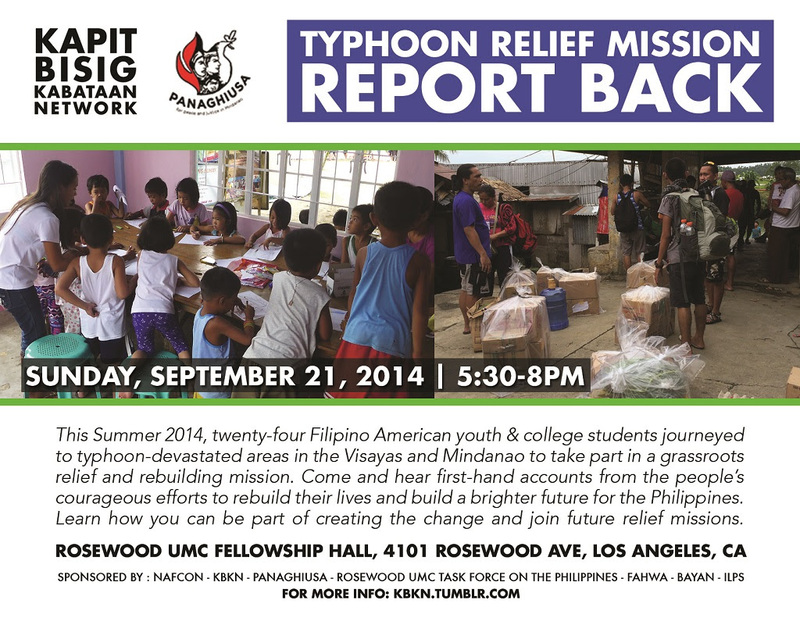 On September 21, 2014, we invite you to join us as the participants of the mission share their personal experiences, thoughts and aspirations of the people who have been devastated by a series of typhoons resulting from decades of unmitigated environmental plunder. Free parking available on N Berendo St.